The Sakura Matsuri Japanese Street Festival is a major event of the National Cherry Blossom Festival in Washington, DC. It is the biggest Japanese street party in the nation. The festival stretches six blocks and includes Japanese performances on three stages and over 200 martial artists demonstrating their skills throughout the day. Other participants include 25 Japanese and Asian restaurants, 30 interactive cultural exhibits and 35 vendors selling Japanese products. New location this year! 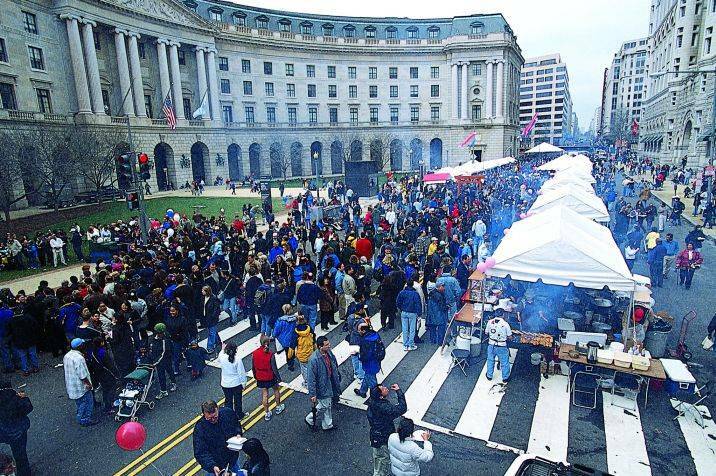 The Sakura Matsuri will be moved to the Capitol Riverfront neighborhood at M Street and New Jersey Avenue, SE Washington DC. This is located near Nationals Park, the baseball stadium for the Washington Nationals. $10.00 per Adult. Children ages 12 and under are free. Purchase tickets in advance online and avoid the lines. Purchase tickets in advance online and avoid the lines. Location : Capitol Riverfront neighborhood at M Street and New Jersey Avenue, SE Washington DC.